Now here is something a little different. 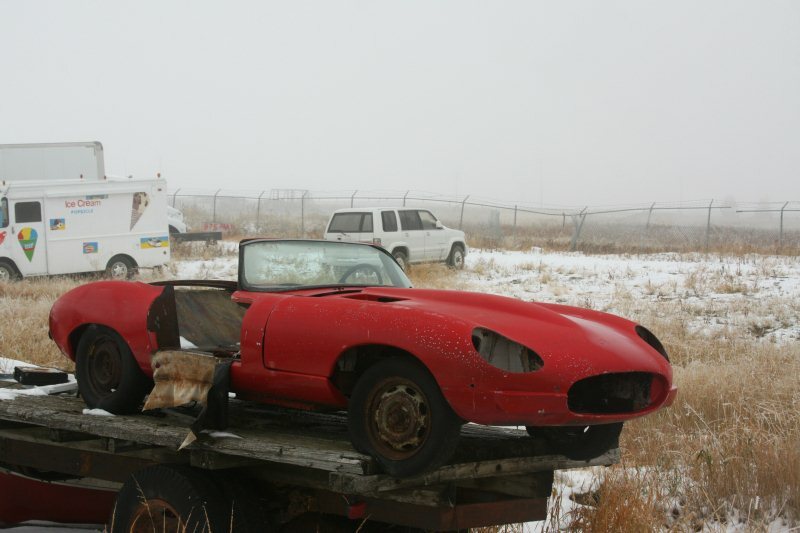 At first glance, it appears to be a poor, neglected and abused Jaguar E-Type; as you get closer, some of its details start to look a little off–sort of like a mix between a Series I and Series II XKE but maybe from an alternate universe. Another few steps closer makes it clear that this particular car is made of fiberglass and not metal: Some sort of a Jaguar E-Type kit car, then. But up close, the strange choice of a donor car becomes apparent. A quick peek up this fiberglass cat’s skirt reveals a straight member. 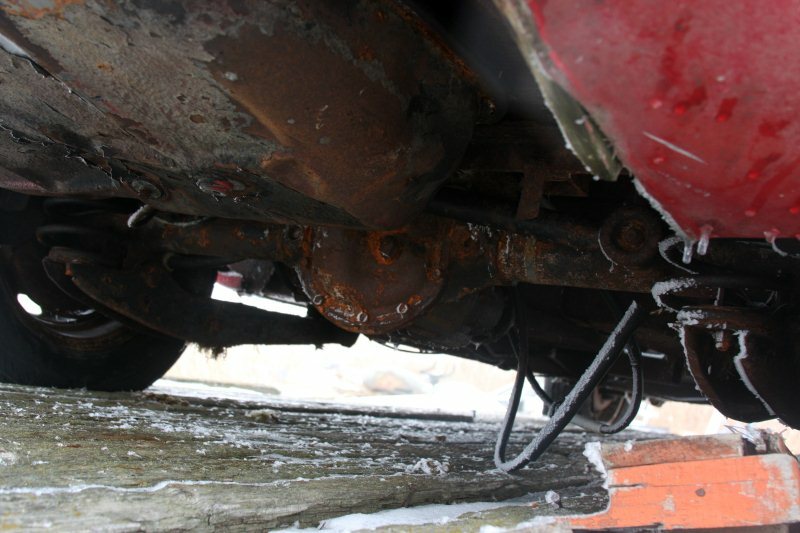 A live axle on a Jaguar? Even on a replica? 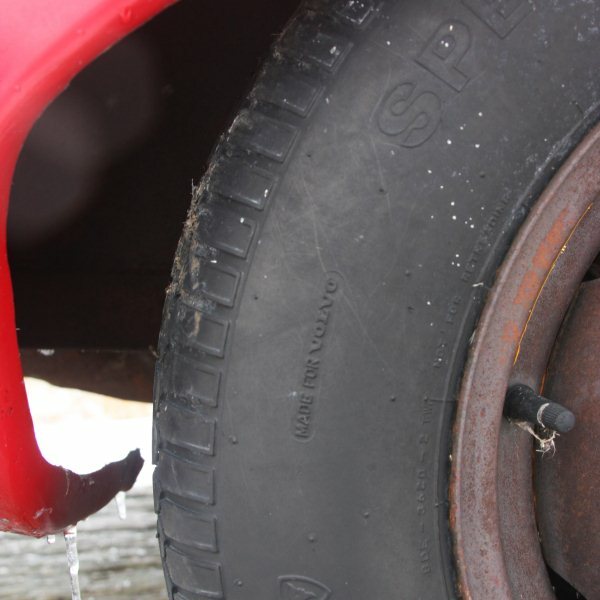 The next clue is found on the tires. The tires actually read “Made for Volvo”. That’s right, this kitten is riding on four Volvo-factory spare tires and rims. That certainly explains the source of the solid rear axle. The builder was obviously very resourceful, as it looks like he fitted the whole 140/240 series rear suspension with axle, arms and springs. That fuel tank is more than likely a Volvo piece as well. Moving topside, the Volvo steering wheel is very prominent. Its squareness clashes a bit with the Jaguar- inspired curves. The wheel and column are from the 240 series, so it’s likely that it was the main donor. 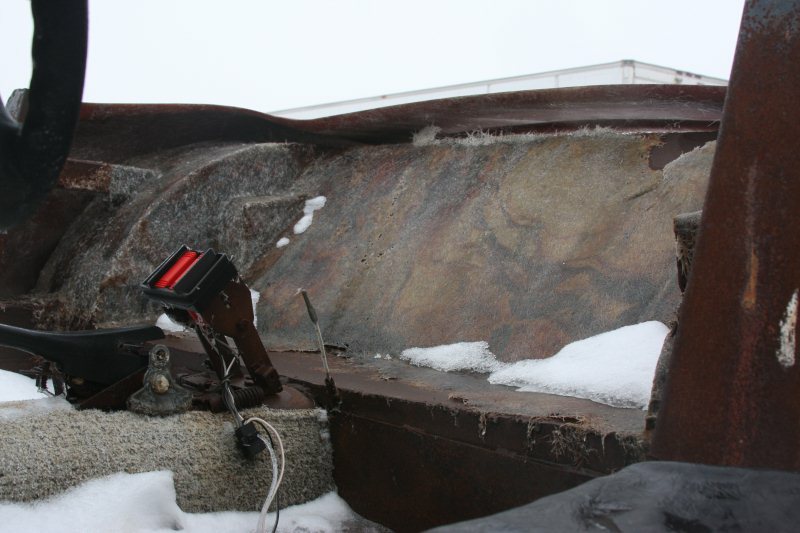 Looks like the metal supports of the dash and possibly even the floor and transmission tunnel could also be Volvo. Seat belts? Volvo again. Having built a kit car myself, I salute this builder for making such good use of his donor car. I veered from my donor car over and over again, and each time it added to the cost and complexity of the build. Maybe he should have passed on re-using the carpet, however. His construction method is very clear in this shot: a beefy steel box frame bonded with a fiberglass body. Sadly, the engine bay was empty, but it wouldn’t be too much of a gamble to suspect a Volvo four-cylinder engine once lived here. The brake booster and steering box are again sourced from a Volvo 240 series. In a rare and obvious deviation, the Volvo front struts weren’t used due to the height restrictions imposed by the E-Type-inspired lines. So what kit is this? There weren’t any markings on it to give us a definitive ID, but I think I was able to deduce the answer. 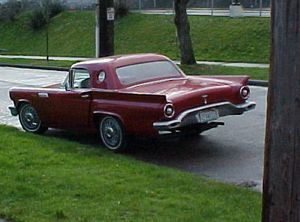 Most kits, understandably, seek to replicate the Series I model, but this example seems to have a wider rear with the tail lights mounted lower like a Series II. Probably the ultimate E-Type replication is the Eagle (as featured on Top Gear), which uses an actual E-Type donor and is much better built than the original. Obviously, this one is not an Eagle. Another well known replica is called the Triple C Challenger. Based on a donor Jaguar XJ, the Challenger is a bit more faithful in its replication, and the rear end in particular is different than the featured basket-case example. The JPR Wildcat seems to be a much better fit. The standard donor was the British Ford Cortina, but from what I’ve heard they were quite willing to work with alternatives for their clients. Engines were all over the map, from the humble-but-willing Cortina 1.6-liter crossflow four to V6s and even V8s. I saw a Ford Pinto-based one on eBay a few years back, so at least a few made their way across the ocean. The big, beefy square-tube frame looks to be a decent match as well. 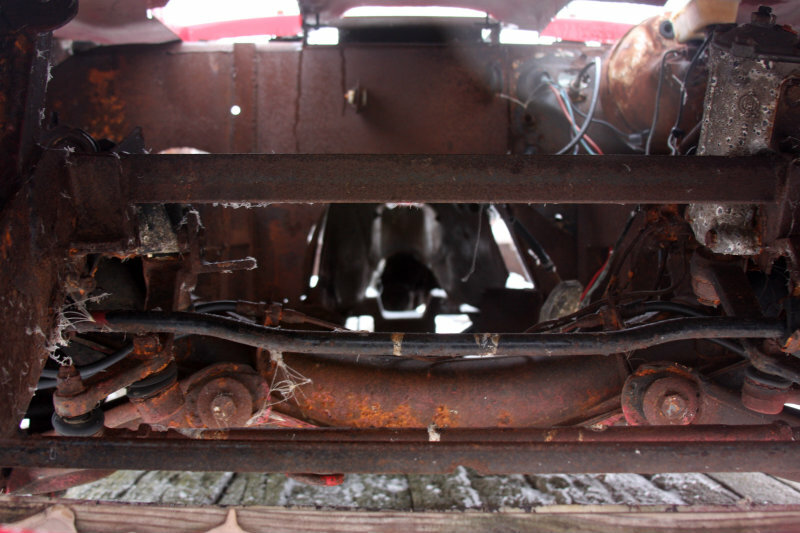 The body looks the same, or at least very close, so I strongly suspect what we have here is a neglected JPC Wildcat. There is even an active owners’ club for these Wildcats, and according to their informati0n JPR was based out of the historic Goodwood Motor Racing track from 1984 to 1997. There were 147 of these kits built before track redevelopment led to the displacement of the JPR works building. The molds still exist, but no more kits are being made. 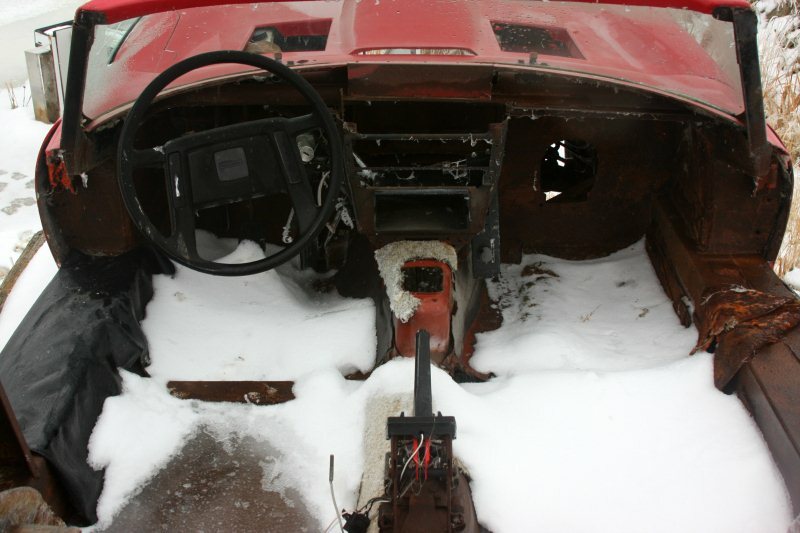 The Wildcat looked to be in rough shape, and I suspect those missing doors and trunk lid would not be easy to source. Probably the best bet would be finding a friendly Wildcat owner who’d let you take a mold from his bits. Apparently, a lot of the exterior trim can be sourced from a real E-Type, making it reasonably easy to find but not likely budget-friendly. Even though the future might seem a bit bleak for this car, I still have to wonder if it was ever used on the street, or is simply an unfinished build that lived under a tarp for years (or decades?) before ending up here. I am not sure there is anything so sad as a partial kit-car, particularly when it is something fairly rare like this one. It will cost a ton of money to finish, and will still not be worth that much. My BIL has a finished kit car of a 1930s Frazier Nash on a VW chassis. It sits in his garage, not worth anywhere near a Frazier Nash, and probably nowhere near a VW in similar condition, either. My kids have seen it and think it is really cool, but I think I would prefer a Karmann Ghia convertible if I wanted a VW sports car. The only kit car I ever looked at was a 57 T Bird replica about 30 years ago. A white Bird with a for sale sign, I stopped. The roof was down, so I opened the driver’s door. The door felt like I could rip it off without too much effort. It had a WV chassis, and a fiberglass body. Ah, yes. The Veebird. They looked fine from a distance, but up close they were pretty crude-looking. Wrong! I don’t think that this thing would look good at a hundred yards or one. The proportions are all wrong. The worst angle was from the back. Look at those VW exhaust pipes! That actually doesn’t look as bad as I would have expected, but yeah, I’m not looking at it close up in person. Keep in mind that the Auto Union 1000SP is basically a ’57 T-Bird scaled down almost to Beetle size, and it’s really cute, so it’s not an impossible task. There’s a lot of rear overhang there, way more than a stock Beetle. 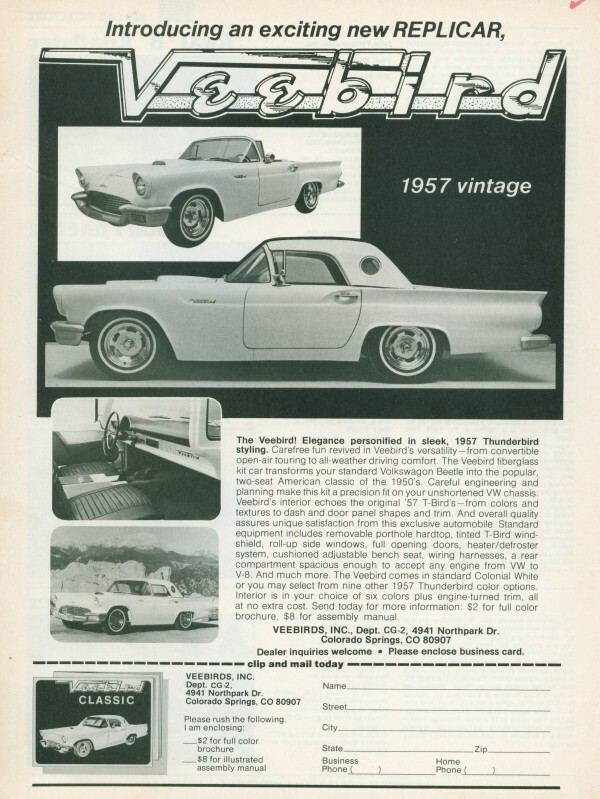 Wonder if anyone dropped a Corvair engine into a Veebird. Sure looks like it would fit. And that should set your mind to thinking. 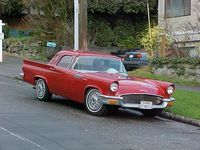 What if Ford, rather than GM, had gone the rear engined compact route in 1960, and used the platform to bring back a two seater Bird as a sports model . . . 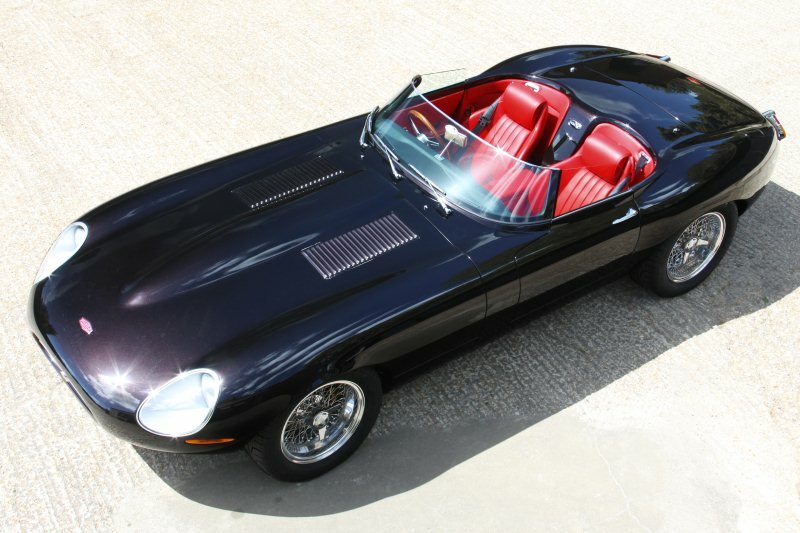 I suppose once it’s completed it’ll be the safest Jaguar E-type of them all. More what’s in the yard please!I’d love a look round. Use the term storage ;yard classic in the search box above for earlier installments of this series. Yes I’ve written a few so far with a few more to come. Sadly all the cars have been sold in the yard now so they are mostly scattered now. “…finished kit car of a 1930s Frazier Nash on a VW chassis.” I have never understood the type of kit car that has the engine in the other end of the car from the model it’s trying to emulate. Gem Whitman, there are lots of shots from this yard – several cars have already been featured here on CC. Now I want to see the reverse, a Jaguar based kit for a P1800 replica. Volvo wheels also fit early Holdens but the chances of someone in Canada cutting up a Holden to build an E type Nah good try I’d have liked to see the finished product. I think either the builder liked Volvos or he just happened to have one on hand. Lotus Seven clones have been built from all sorts of unlikely donors. The opening picture for me is classic. It just hits me in so many ways….A cold and lonely field, a light but cold snow on the ground and a sky so gray that it looks like more snow is to come. 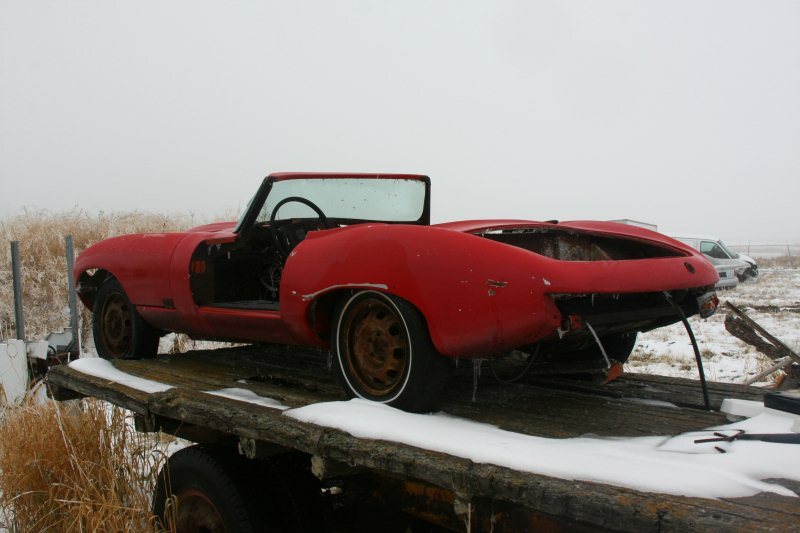 And in all of that cold gray is a bright red sports car…a Jaguar E type of all cars. I look at that car and I wonder about the dreams that carried the owner through his efforts to bring this car to life. Did he work late into the night after a hard days work? Was a loving wife there supporting him along the way? Did he promise her a long vacation on late afternoon Autumn sun swept country lanes? And why did this car, someone’s dream, end here? Did someone in the home take ill, forever closing the dream? Were threats of marriage ended uttered? DId the spark of creativity die on the vine? i look at this car like I’m sure many of you did the same and wondered; what would it take to complete a car like this? We picture ourselves with our better half motoring down that country lane. I suppose that is how this crazy car stuff begins…….with a dream. Great catch and write up, David! I lost interest in kit cars when I heard that the California smog nazis made it law that “specialty constructed vehicles” have to meet the emissions standards of the year it was built! 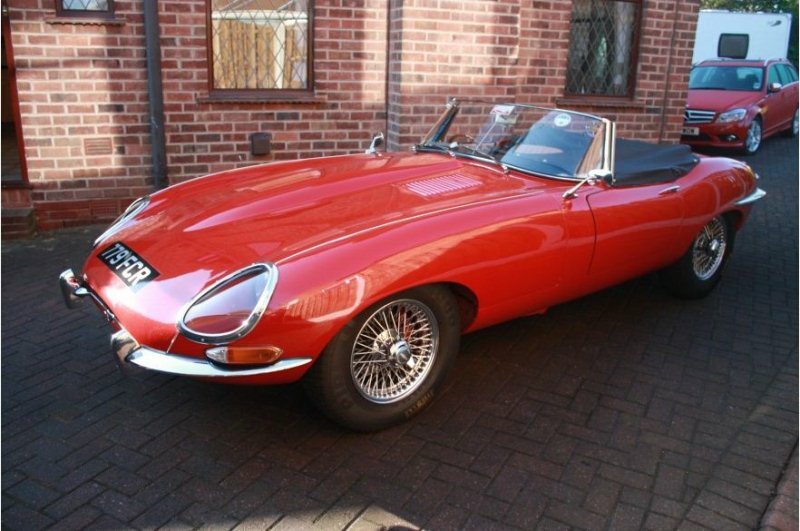 Is the e type / Volvo for sale do you think? Same question as above, is the jaguar sold or would it be possible to buy it. The clapped out kitcar in question is without doubt a JPR Wildcat. The basic model used Cortina engine and suspension in 2 litre form but there are some superb ones using Rover V8’s, Cadillac Northstar, Ford |Essex V6, and Datsun 280Zx engines. Look up the website jporwildcat.co.uk There is a nice Le Mans version up for sale. My brother bought a Cobra clone. Modern body, from S Africa. The frame was a modified BMW 3. The total cost was $50k. He kept it for 5 years, and sold it for $45. He said he had more than $5000 worth of fun with it! It was an excellent car, for a reasonable price. Not all kits are junk. did anyone ever tried to use a mk3 supra as base for E type replica? proportions seems good to use as far as concerns the length? !